Android Nougat 7.1 ROM, LineageOS 14.1 for Galaxy Grand Prime has now arrived via an UNOFFICIAL build. If you want some more Lineage OS ROMs or wanna taste the OFFICIAL Lineage OS build then stay tuned to the LineageOS 14.1 ROM Devices list page. This Galaxy Grand Prime Lineage OS 14.1 is brought to you by developer CarlosArriagaCM, Hassan Sardar (Has.007) and another build is brought to you by Boulaxx. THIS IS AN INITIAL BUILD WHICH MAY HAVE MANY MORE BUGS THAN YOU CAN IMAGINE. HAVE A BACKUP BEFORE FLASHING THIS AND TRY AT YOUR OWN RISK. Installing a custom ROM on a Galaxy Grand Prime (fortuna3g, SM-G530H) may require the bootloader to be unlocked, which may VOID your warranty and may delete all your data. Before proceeding further you may consider backup all data on the phone. You are the only person doing changes to your phone and I cannot be held responsible for the mistakes done by you. Which codename to choose for which device?? Thanks to Guga Figueiredo for his valuable finding. Download and Copy the GApps and LineageOS for Galaxy Grand Prime ROM ZIP to your phone. First flash the Galaxy Grand Prime LineageOS 14.1 ROM ZIP from device. Then flash the GApps zip from your device memory. Reboot and Enjoy the Nougat 7.1 Lineage OS 14.1 ROM for Galaxy Grand Prime (fortuna3g, SM-G530H). 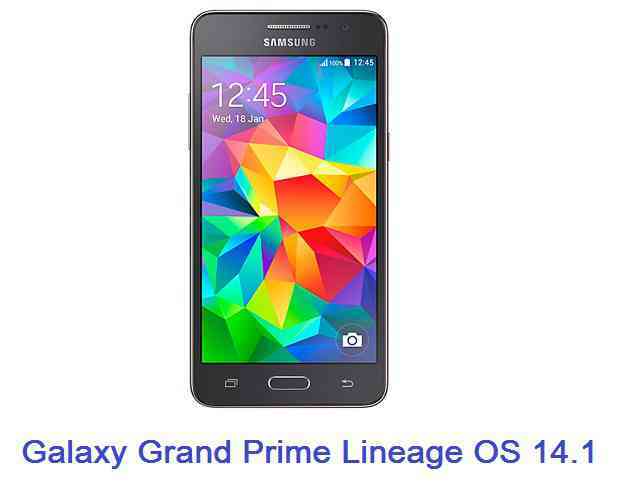 Copy the latest Lineage OS 14.1 for Galaxy Grand Prime ROM ZIP file to your phone. Stay tuned or Subscribe to the Galaxy Grand Prime (fortuna3g, SM-G530H) forum For other Android Nougat ROMs, LineageOS 14.1 ROMs, other ROMs and all other device specific topics. Development thread of Lineage OS for Grand prime by Boulaxx is here. What exactly is the problem on your phone?? Does it have difficulties turning on while the screen is off, that’s what are you saying?? I’ve got a broken camera after flashing lineageOS 14.1. “Can’t connect to camera” msg. I tried 3rd party apps, some restarting camera solutions from online tutorials, reflashing LOS 14.1, but to no avail. camera works fine in lollipop stock rom. Only rear camera effected. Front camera worked fine. Any suggestions? Hello, I admire your work and I would like to test it on my smartphone, but I have some unknowns that need to be clarified to give way. I will apply the ROM for daily use, will the ROM give me some kind of problem? Answering my own question from before, turns out I was missing information. My problem was due to baseband version. There are 3 builds available for the G530H model, each with a particular codename that match a specific baseband code. I didn’t know about this. So if someone else is having this problem, and is ill informed as I was, this may be the issue. Thanks for your input. I have updated the same in the Downloads section, which in turn will help other users. cual seria la rom correcta que tendria que instalar?